Well, after a too-long-for-comfort review hiatus, I can officially announce, I live in Boulder, CO now! The transition from Pittsburgh to the foothills of Colorado was swift and exciting. As you can imagine, I was so incredibly sad to leave my beloved Pittsburgh restaurants (and my family =) ) behind. Tim and I spent our last Friday night date night at our usual Friday night (and most favorite) spot – Noodlehead. And it was a sad goodbye. Our favorite waiter said he would ship us Pork Buns, and if there is any possible chance he reads this someday, I would love to take him up on that offer. 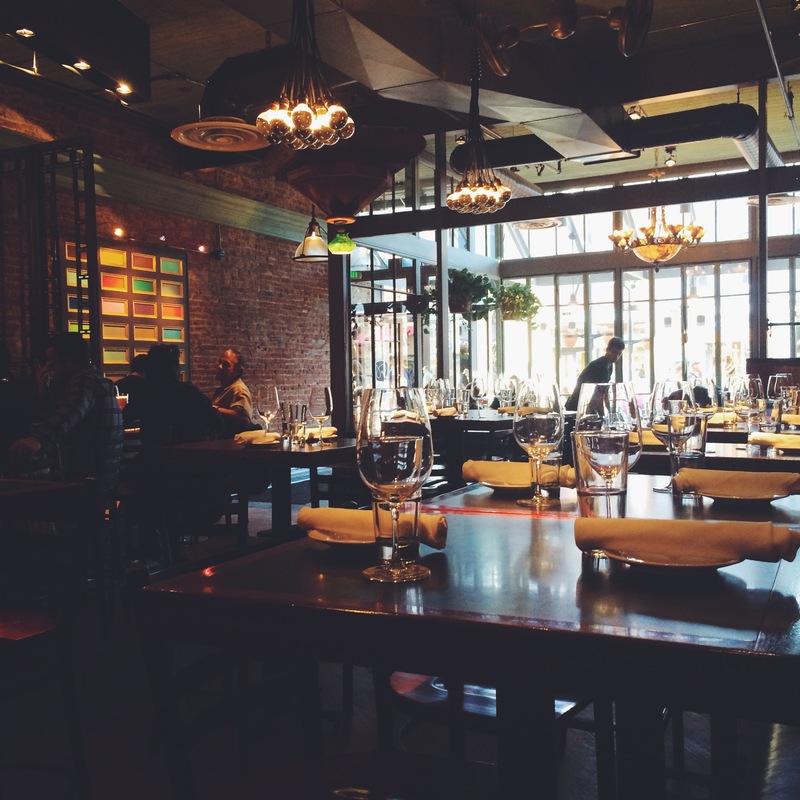 But it was time for an adventure – and a new state of restaurants to explore!! 1.5 days of driving, 2 truck stop naps, 12 Serial podcast episodes and too many hours of snooze-fest Kansas plains later.. we found ourselves on the beautifully welcoming Pearl Street in downtown Boulder. The weather was sunny and warm (like as in no clouds in the sky and 65 degrees), the streets were bustling, and I was IMMEDIATELY overwhelmed with the amount of new restaurants. I mean literally there are hundreds and hundreds. Sushi, Mexican, Thai, Italian.. fancy, casual, sports bar.. and everything in between. If you know me at all, my first instinct in situations such as these is to whip out my phone, open my Yelp app, and make an informed dining decision based on proximity, price point and cuisine. But that was the Pittsburgh me! My new challenge for myself is to not get so hung up on the planning, and go more with the flow. And so far, it has 100% been paying off!! Based on nothing but a quick menu scan that was hung outside the restaurant and a good vibe, we chose to spend our first Saturday dinner at Riffs on Pearl Street. We instantly loved this place. Cozy, welcoming decor, with a modern/industrial element. Not too fancy – but it had a special feel that was perfect for our first date in Boulder. 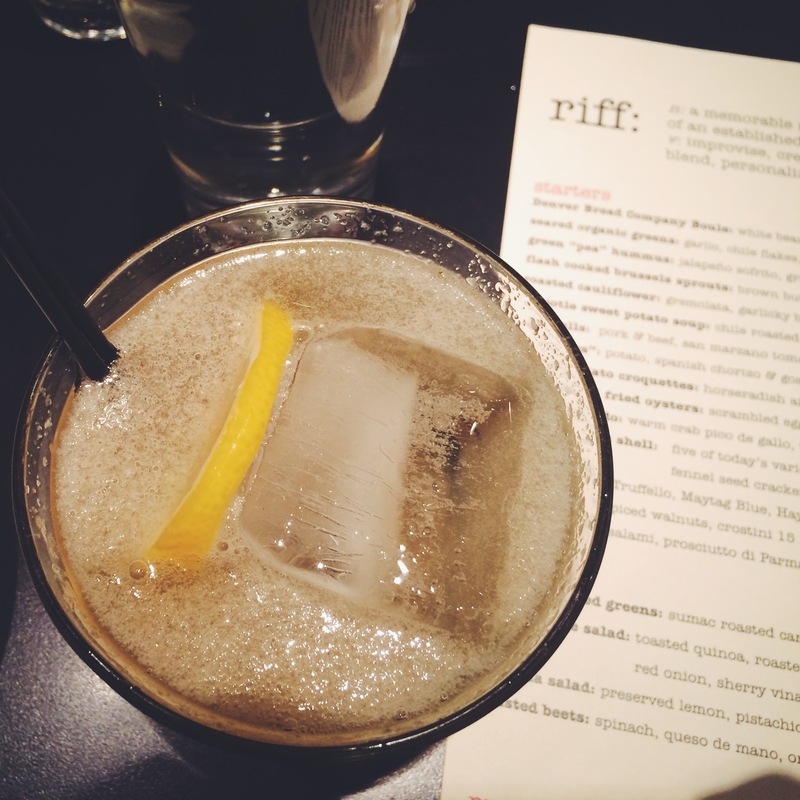 If you’re curious about the meaning of “Riffs” as I was, the menu explained : “Riff – n : a memorable refrain, variation on a theme, a fresh version of an established thought or action. v : improvise, create a new version, modify, stylize, blend, personalize, participate, make one’s own.” Love! One thing I can tell you with absolute confidence, people are just friendlier here. I know, I know.. Pittsburgh is home. And it always will be. But EVERYWHERE you go here, people greet you with smiles and a palpable cheerfulness and a true zest for life and their choice to live in this beautiful state. As soon as we sat down, our lovely waitress excitedly welcomed us to Boulder and gave us their happy hour drink menu. (Noteworthy: Boulder has AMAZING happy hours. I’m not sure if it’s because it’s a college town, or just because it’s awesome in general.. but happy hours are often ALL DAY and feature amazing deals.) 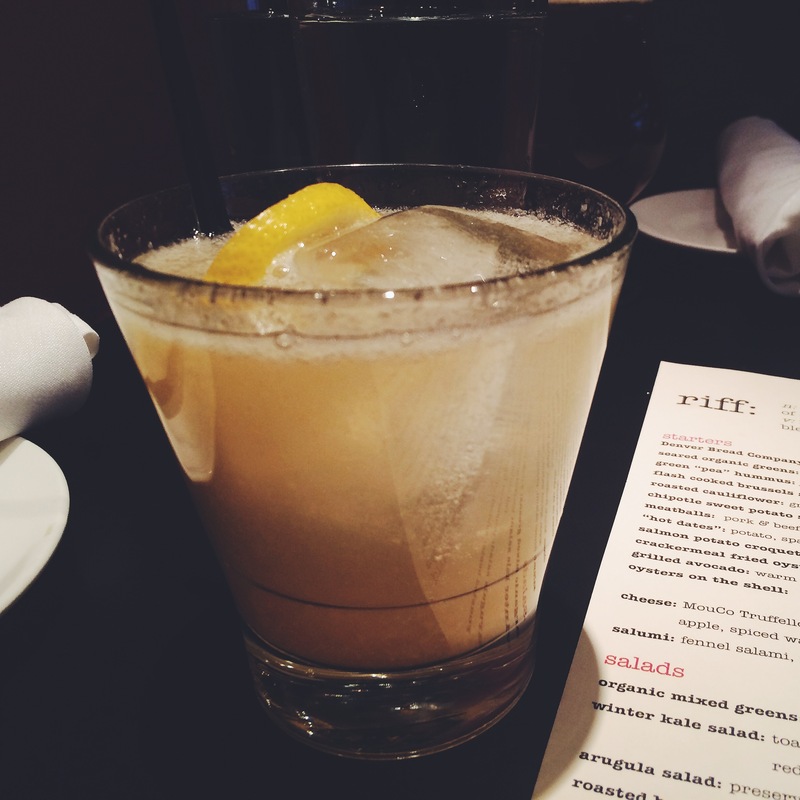 To drink, I ordered the Perfect Pear ($6): Muddled Pear, Bulleit Bourbon, Lemon Juice, topped with Prosecco. Oh my goodness was this drink amazing. The pear was not overly sweet, the Bourbon was strong and delicious, and the Prosecco added the perfect pop to this cocktail. I know I rave about drinks often, but this is truly one of my favorite drinks I’ve had. I can’t wait to go back for another. 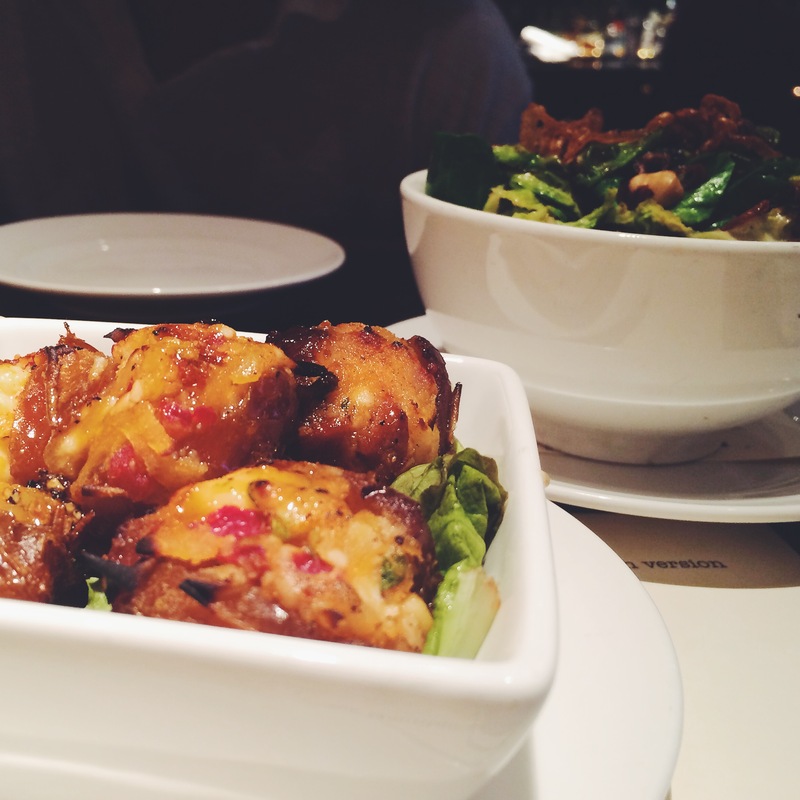 For the apps – we chose two from the happy hour menu. (This particular HH is from 3-6). 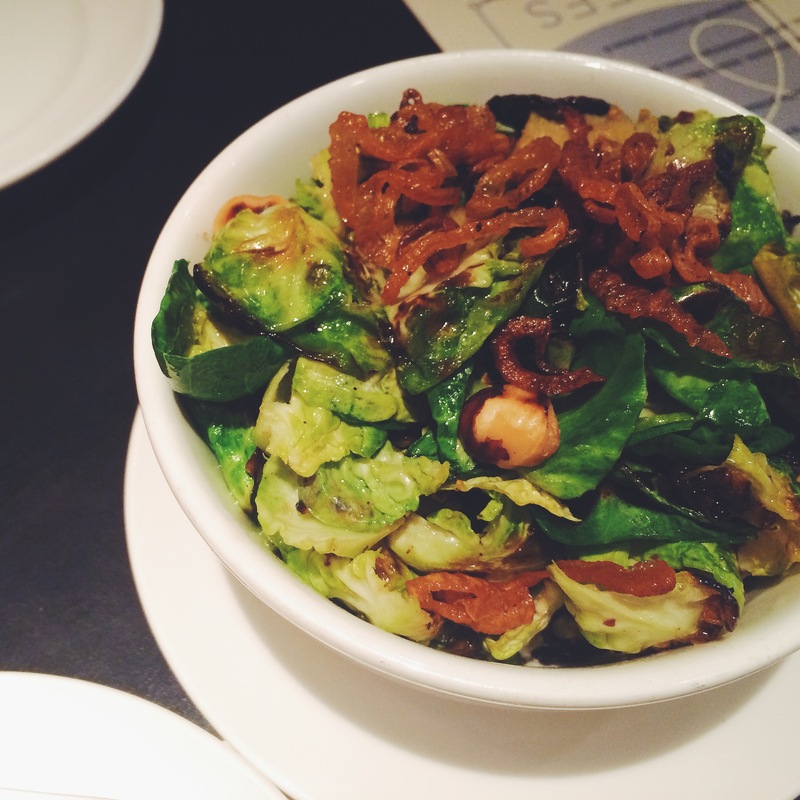 Flash Cooked Brussel Sprouts ($5): Brown Butter, Hazelnuts, Crisp Shallots. We basically swallowed these whole. They were buttery, but not too rich, smokey and succulent with a perfect crunch of the hazelnuts and shallots. 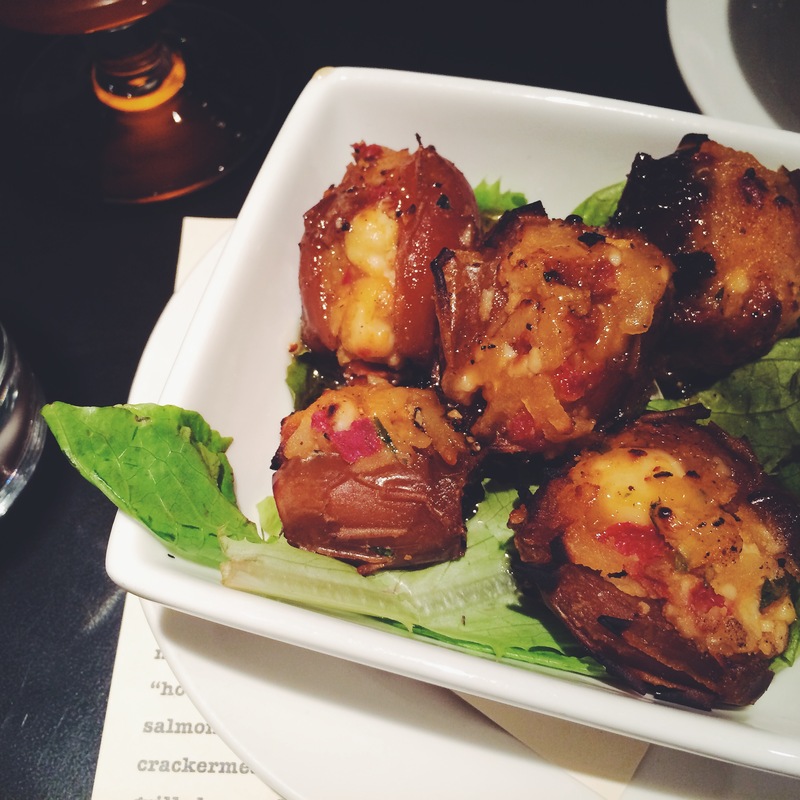 We also ordered the “Hot Dates” ($5): Potato, Spanish Chorizo & Goat Cheese Stuffing, Black Pepper and Honey Drizzle. These were a total gamble, since I’m not really into cheese and Tim didn’t even know what a Date was. But they were delicious. Creamy and rich with a nice salty compliment of the chorizo. They were a littttle heavy for an appetizer (we planned on ordering dinner entrees as well), and they were very sweet. So, I would definitely recommend them for an all-app meal. They were super filling. 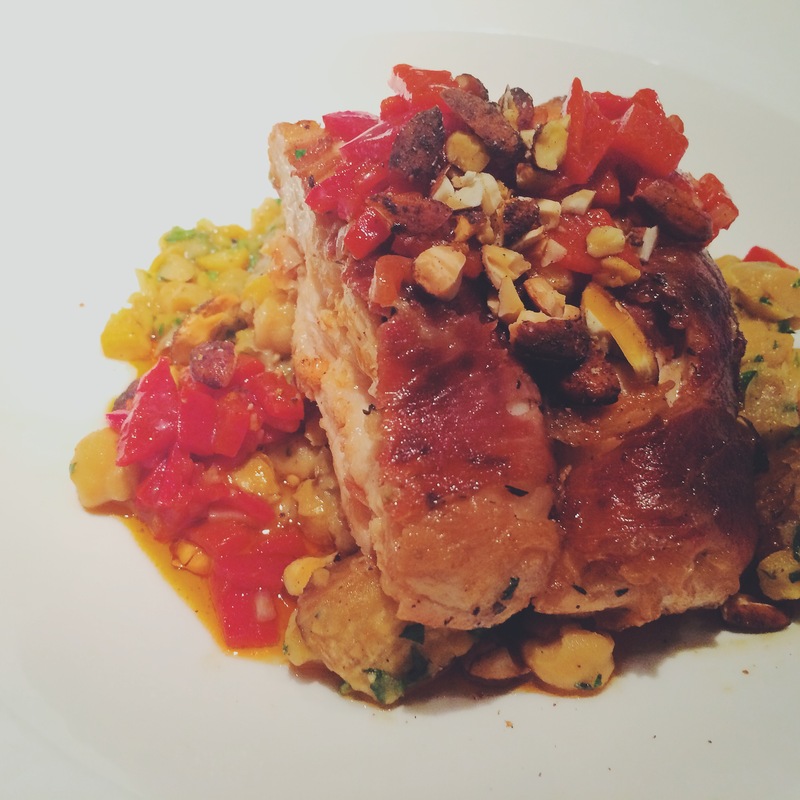 For my entree, I ordered the Prosciutto Wrapped Chicken ($15): Saffron Chickpea & Winter Squash Ragu, Romesco Relish. I don’t normally order chicken from restaurants, I feel it’s a bit boring (espesh when I can order like duck confit). But something about this dish caught my eye, and it was soooooo good omg. The prosciutto was deliciously salty and slightly crispy, and the chicken was so tender and perfectly seasoned; there looked to be an herb rub under the prosciutto wrap, which elevated the flavor even further. The chickpea mixture was hearty, garlicky and scrumptious, and paired perfectly with the zest of the red pepper relish. The crunchy hazelnuts added the perfect balance of texture. I was so full about halfway through, but I just couldn’t stop eating this until my plate was clean. It was so yummy and satisfying. This happy hour is amazing, and like I said is from 3-6. They have great drink deals and specials on their delicious apps. We were so full from our 2 apps and 2 entrees, I think next time we’d either do 3/4 apps and no entrees, or 1 app and 2 entrees. Their cocktails all seem to be creative twists on favorite classics – I can’t wait to try more. There was no wait when we arrived (I think it was around 4:30) but they do take reservations!